In 1987, Julian Knight shot and killed seven people in Clifton Hill, Melbourne. A further 22 were wounded. He's currently serving seven life sentences. He is also now taking the local state's corrections department to court because they won't let him have a video game console. Knight first requested to have a personal computer in his cell seven years ago, but was knocked back. He's since made a further seven attempts, none of which were successful. Corrections Victoria's (the local corrections department) decision to also block his 2009 request for a "PlayStation" (it's not specified which) has led him to say he is being "unfairly treated", as other prisoners have been granted similar requests. So he's taking his case to the Supreme Court, seeking not only the PlayStation, but the granting of his original request for a PC as well. 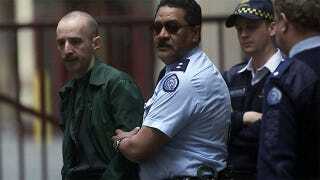 Knight is in prison having been convicted of the Hoddle Street Massacre, as it became known. A former army cadet, on the evening of August 9, 1987, he climbed atop a billboard - armed with two rifles and a shotgun - and fired at numerous passing cars (as well as a police helicopter) on the Melbourne street.